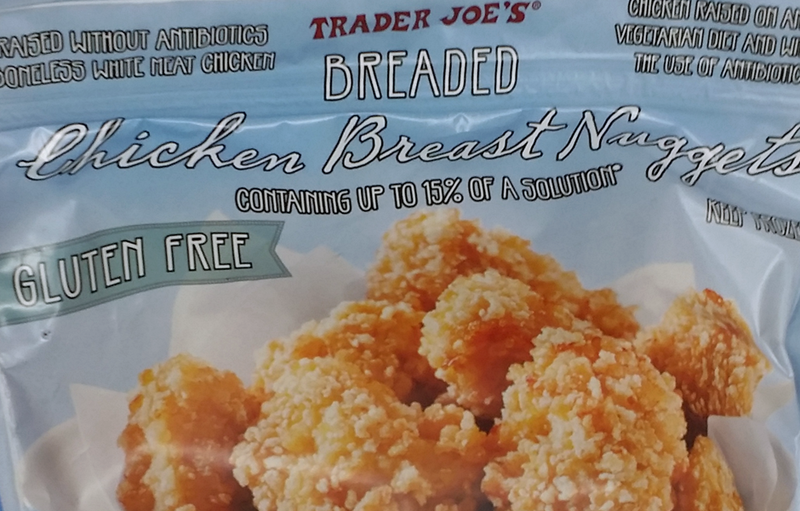 Trader Joe's GF Chicken Nuggets - I Can't Eat What? Gold comes in nuggets. So does wisdom. Why not chicken? It does of course, and Trader Joe’s Gluten Free Breaded Chicken Breast Nuggets are the latest tasty development in chicken chunk flavor and technology. One final nugget of wisdom: Go get your one-pound bag (about 16 pieces) of our Gluten Free Breaded Chicken Breast Nuggets for $4.99 and save yourself the belly-ache (if your belly’s intolerant to gluten) and the extra dollars you would’ve spent elsewhere on similar (but not as good!) nuggets. Chicken Breast Meat Containing up to 15% of a Solution of: Water, Seasoning (Garlic Powder, Salt), and Sodium Phosphates. BATTERED with: Water, Yellow Corn Flour, Modified Corn Starch, Modified Potato Starch, Salt, Leavening (Sodium Aluminum Phosphate, Sodium Bicarbonate), Garlic Powder, Onion Powder, Spices, Xanthan Gum. BREADED with: Rice Flour, Modified Potato Starch, Salt, Garlic Powder, Onion Powder, Sea Salt, Dextrose. PREDUSTED with: Yellow Corn Flour, Modified Corn Starch, Salt, Garlic Powder, Onion Powder, Spices. Breading set in Soybean Oil. CONTAINS SOY. Most kids LOVE chicken nuggets and most of them are pretty questionable food items. It’s great to have a healthier gluten free option to help our kids feel more normal. It’s hard for kids to deal with food allergies. They feel weird and deprived. While I don’t think chicken nuggets are the healthiest fare, I do think these are a great way for those starting out on a gluten free diet to keep the feelings of deprivation at bay. Black Olives: Rich, Nutritious and Dangerous! Might be the cause for your eczema?